Kathy Brown joins Fennel & Fern to write about her work as a garden designer. 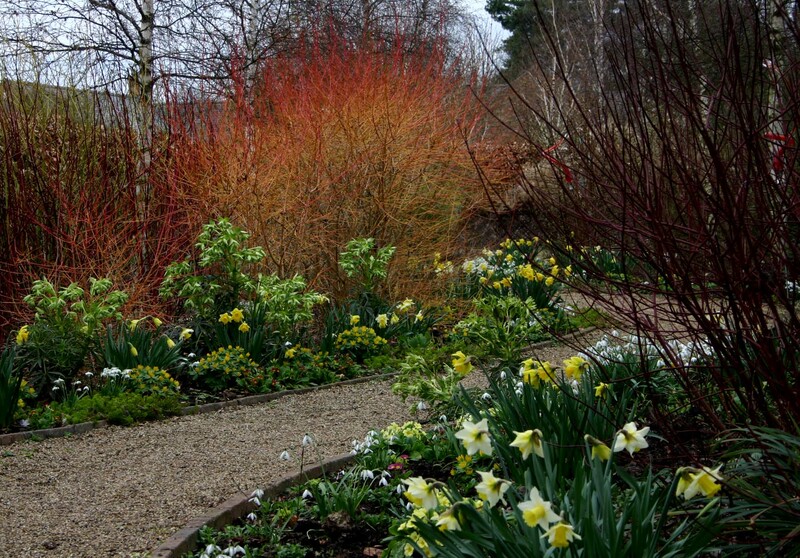 The Manor House, Stevington is her stunning garden, and she tells us about how she created it. There was almost no garden when we arrived at Stevington. We inherited a donkey, a large formal fishpond and a solardome; an ordchard and about 200 leylandii. It feels as though we have been pioneers, making new gardens out of the fields, slowly taming the landscape. The donkey eventually died and we designed a formal French garden from the house to the road, then added a wisteria walk with eight wide arches right besides it. The formal fishpond lost its lining and we turned it into a major containers display area to show off the containers I had used on my Chelsea Flower Show stand in 1995. We managed to buy extra land and created several shelter belts (the village has a windmill and our site was exposed) using pines, two avenues of white stemmed birches and gingkos and surrounded the entire garden by beech hedging, some purple some green. Roses grow well on our heavy clay soil and we have created lots of arches and pergolas for them to grow through; but they clothe the walls and trees as well so end May to end June is a lovely time here. And when they are over the late flowering clematis kick in, using the roses as a climbing frame; so we have nearly 50 rambling and climbing roses and over 100 late flowering clematis. 14 February, 2 & 23 May, 16 June, all Tuesdays in June and July, 25 July and 29 August. Visit Kathy’s website for more details. All images copyright Kathy Brown. All rights reserved. Ah, so this is the person who designed the inspirational (to me, anyway) winter interest garden. Her garden is awesome.